The Constitutional Court of France has repealed a law criminalizing denial of the so-called “Armenian genocide”, which was adopted by the country’s Senate. On January 23 the French Senate passed a bill making it a crime to publicly deny that the Ottoman Empire’s 1915 killings of Armenians was a genocide. It is always amazing to observe the ignorance of the Canadian left when it comes to Quebec politics. The reasons for this, I believe, are similar to what blocked the English left over Ireland for decades, as well as the French left over their African empire. It is costly in the short term to oppose its “own” imperialism, because it is supported by a very wide popular colonial mentality. But in the long term, it is deadly. On all these important issues, Mulcair has been a centre-right liberal. Some Canadians have raised the argument that Mulcair would be able to “secure” the NDP vote in Quebec, so that his leadership would be beneficial for the party. This is very far from reality. Mulcair had very little to do with the orange wave of last May. Mulcair represents a very strange riding which is called Outremont. It is the home of the wealthy francophones, on the West side, who have been tiring of voting for what became to be known as the party of crooks (Liberals). It is also the home of many immigrant communities and the centre of the orthodox Jewish community which numbers more than 20 per cent of the total population of Outremont. It is a unique feature in Montreal’s demographic. This community supports Mulcair for reasons that are far off from any progressive meaning, or from the anti-racist and anti-discrimination battles that abound in the city. Outside of this perimeter, very few people would support Mulcair. Some would say that Mulcair has the support of the majority of the Quebec NDP MPs. The fact is that these MPs are mostly politically inexperienced, and without any social base. Before May 2, and the TV appearances of Jack Layton in Quebec, the NDP would not have been able to bring more than 200 people into a room. It had local committees in fewer than five ridings (including Outremont). Currently, some of the most serious NPDers in Quebec have decided to support candidates other than Mulcair. All in all, Mulcair as the leader of the NDP, would be a disaster in Quebec. The support the party got on May 2 is already melting like snow in the spring. Canadians who still believe in the NDP as a vehicle for change should think about these matters seriously. The Arab Digest had previously reported on Syrian Opposition member, Mamoun Al-Homsi, and his call for ethnic cleansing of minorities in Syria. Well, new questions emerge on his politics and suspicious ties with Israel. 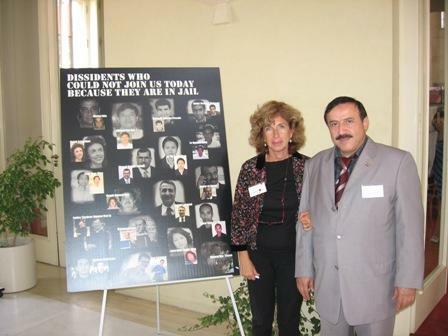 Mamoun Al-Homsi is pictured above at the Prague Security Conference (NeoCon) with the Israeli-Italian right wing politician and hardline Zionist, Fiamma Nirenstein. Nirenstein who is a neocon Zionist has spent much of her life in an illegal East Jerusalem Settlement called Gilo where she still maintains a home. Nirenstein is known for translating books of Nathan Sharansky, Bernard Lewis and Ruthie Bloom; she led efforts on behalf of the Israeli government to thwart the Palestinian bid for full UN membership and Statehood. Nirenstein spends her year between an Italian residence and the East Jerusalem settlement with her husband, Israeli photographer Ofer Eshed. The question remains, what was Homsi doing with her in Prague? Homsi has also met her and U.S. based Farid Ghadri, a pro-Israeli opposition figure, in Rome where they discussed Syria. Nirenstein later wrote a post about her meeting with the two, expressing her deep worries over Hezbollah’s capabilities and Syria’s arsenal of rockets, capable of reaching Israel. PS. The photo’s credit is for Alessandro Lattanzio who kindly translated our earlier article on al-Homsi to Italian. Here is his post in Italian along with the photo. A Syrian dissident calls for the ethnic cleansing of minorities! Robert Jensen is a professor of journalism at the University of Texas at Austin. On Monday, Israeli officials announced their intention to construct a train system for Israeli settlers living in violation of international law in the West Bank. Although Israel’s Transportation Minister Yisrael Katz said that the proposed rail lines would eventually also serve the Palestinian population, the proposed 475 kilometers of rail lines would cross any existing or negotiated territorial lines between Israel and Palestine, and would essentially impose Israeli sovereignty over the entire West Bank. According to a map of the proposed rail system obtained by the Israeli newspaper Ha’aretz, the 11 proposed train lines would include a line from Rosh Ha’ayin (northeast of Tel Aviv in Israel) through the settlement of Ariel, in the northern part of the West Bank. One proposal also includes a continuation of the line with a tunnel under the Palestinian city of Nablus, to reach Israeli settlements constructed on stolen Palestinian land east of the city. The proposed rail lines would also include a north-south line running between Israeli settlements near Jenin, Ramallah, Jerusalem and Bethlehem, and a parallel line running on the eastern edge of the West Bank, connecting cities inside Israel with illegal settlements constructed in violation of both international and Israeli law in the occupied Palestinian territory. According to the Ha’aretz report, the national rail system of Israel, Israel Railways, paid engineer Gidon Yerushalmi one million Israeli shekels to create the plan. But most sections of the proposed railway would violate signed agreements between Israel and the Palestinian Authority, and would also violate international law. Still, the Israeli Transportation Minister voiced his hope that the plan would move forward, and has already authorized funding for a section of railway running from the northeast of Tel Aviv to the illegal Israeli settlement of Ariel. RAMALLAH – Khader Adnan is in a stable condition after undergoing surgery on his intestine after his 66 day hunger strike, a lawyer for the Palestinian detainees’ center said Tuesday. Raed Mahamid said after visiting Adnan in Zeev hospital in northern Israeli town Safed that his condition is good, and he is recovering from the anesthesia used during the operation. Adnan underwent surgery after reporting severe pain in his abdomen two days ago, caused by an intestinal blockage, after he went for two months without food. Israeli officials announced last week that they intend to release Adnan on April 17, shortly before his administrative detention term was set to end, and would not renew the order. In return, Adnan agreed to end his hunger strike, the longest ever held by a Palestinian prisoner. Female prisoner Hana Shalabi, who is being held under the same regulations permitting detention without charge, started a hunger strike on Feb. 16 after she was re-arrested, despite being freed in a prisoner swap deal in October.